This is a gallery of pictures of some of our former residents. My thanks to everyone who has shared their family treasures so far – please get in touch if you have some pictures to add to this page. 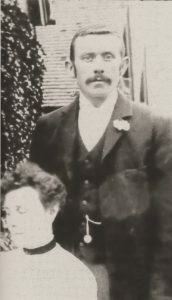 Charles Thomas Ettridge and Laura Harriett Gower married at St Mary’s church, Welwyn in late July 1901. A few months before their wedding – in the census of March 1901 – Charles was living with his parents William and Mary Ettridge in Whitehill (Welwyn) and Laura was living in Wood Green with her widowed brother Arthur, who was a police constable. Laura’s parents George and Emily Gower lived in Whitehill. In the two previous census returns – in 1881 and 1891 – the Gower and Ettridge families both lived in Whitehill, so Charles and Laura would have known each other throughout their childhoods. Charles and Laura’s only child, Violet Maude, was born in December 1902 and baptised at Ayot St Peter church on 8th February 1903. At the time of her baptism the family lived at Whitehill and Charles had the intriguing occupation of “gas maker”. In the 1911 census the family were living in Dowdells Wood Cottage, Ayot St Peter. Charles gave his birthplace as Welwyn and Laura gave Codicote. Charles worked as a farm labourer. In the 1939 national register Charles and Laura were living in Greggswood Cottages, Whitehill. 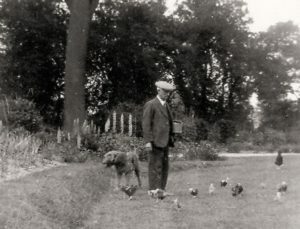 Charles worked as a “jobbing gardener”. Charles died in 1946 and Laura in 1961. They are buried in the new churchyard in Ayot St Peter. 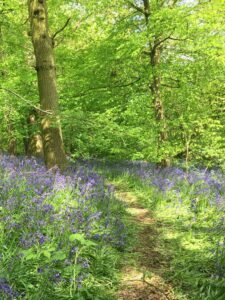 Their daughter Violet attended Ayot St Peter school and can be seen as a pupil in one of the group photos on this website. She later became a teacher at the school. She married Harry Cooper, who was the church organist, at Ayot St Peter church on 7 April 1928. After their marriage the couple lived in Welwyn Garden City. 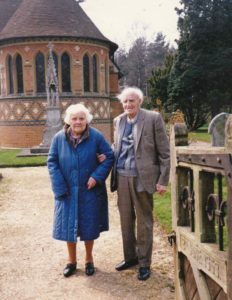 Harry and Violet celebrated their diamond wedding anniversary in 1988 by returning to visit Ayot St Peter church. George Frederick Freeman married Mary Shelton in the Pershore area of Worcestershire towards the end of 1883. Both had been born in Worcestershire but they must have moved to Ayot Green soon after their wedding, as their first child George Henry was baptised in Ayot St Peter early in 1885. Five other children followed – Horace Allen born 1887 and who sadly died in 1890 aged 3 1/2, Beatrice Mary born 1892, Walter George born 1893, Cyril Thomas born 1899 and finally Ethel Ellen born in 1904. 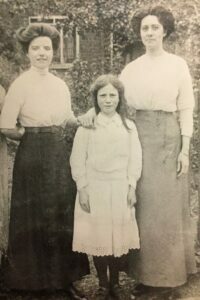 This photograph shows the two girls – Beatrice Mary on the left, with her little sister Ethel Ellen, and an unknown female cousin on the right. George Frederick worked as a gardener in Ayot St Peter and died on 7 December 1916 aged 64; his widow Mary died on 3 July 1930 aged 68. They are buried together in the old churchyard. Beatrice Mary married Percy Coleman of Kimpton in 1920. 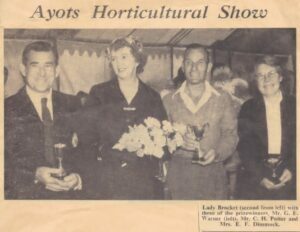 In the 1970s, Ethel provided the list of names for the Ayot School photograph which you can see on this page. The photograph includes Ethel and her older brother Cyril. Ethel died in 1976 and is buried in unmarked plot D28 in the new churchyard. William George Hope married Harriette Jane Goodenough in the parish of St Luke, Chelsea on 10 June 1902. William gave his occupation as “butler”. Very soon afterwards the couple moved to Hertfordshire, where their first daughter Alma Sarah was born in Codicote in 1903. The second daughter Jessie Harriet was born in Codicote in 1905, and the youngest girl Vera Ellen was born in Digswell in 1908. By the time of the 1911 census the family of five were living in Digswell, and William was employed at Digswell House. In 1913 Alma died at the age of just nine years. 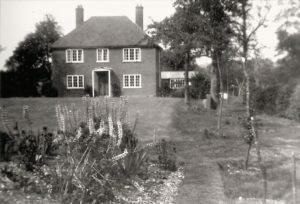 In 1928, William purchased a piece of land close to the Great North Road at Welwyn and had a house built there which the family named “Sandyhurst”. The land had previously formed part of the Lockleys estate. It is likely that William was by this time employed by the Wilshere family at The Frythe, and they may have helped with the purchase price. In the 1939 national register listing for Sandyhurst, Jessie is recorded as a “school teacher”. 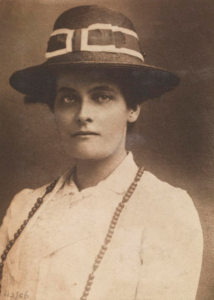 Vera’s occupation was “Supervisor, telephone service” and in the column normally used for war work she’s recorded as “A.R.P, British Red Cross”. By this time the girls’ father William was describing himself as a “poultry farmer”. Sandyhurst has never been within the boundary of Ayot St Peter parish, but it may be that Vera and Jessie attended services here rather than Welwyn. 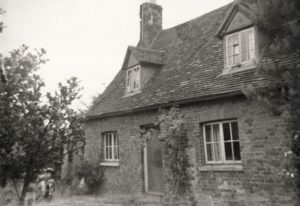 Edna May Jakings was born on 20th September 1918 at the Old Horse and Jockey public house on Ayot Green, the youngest daughter of Albert and Edith Lily (née Bunting) Jakings, who later lived at The Old Cottage on Waterend Lane (now known as “Crackendell Cottage”). Albert Jakings had been born in 1884 in Islington, the son of George and Mary (née Silby) and had the most unusual middle name of St Gatien which was the name of a famous racehorse of the time. The story goes that his father won some money on the horse around the time of Albert’s birth. Edith Lily Bunting (known as “Lily”) was the daughter of George and Emma (née Davies) and had been born in the Poplar area of London in 1891. Albert and Lily married in Poplar in the first quarter of 1910 and had four daughters: – Dorothy Edith in 1910, Kathleen Elsie in 1912 and Winifred Grace in 1913 (all born in London) and finally Edna May born in Hertfordshire in 1918. The family moved back to London after World War One. Edna May Jakings married Alfred Henry Edward Goodridge in London on 31st July 1937 and at the start of World War Two moved back to Ayot where their first son Michael was born at Brocket Hall on 11th November 1941 and baptised at St Peter’s Church. Moving back to London after the war the family increased to four boys and Ayot became summer holidays for them all. Albert and Lily Jakings died in 1959 and 1955 respectively and are buried in the churchyard at St Peter’s Church, just inside the gate. Edna and Alfred Goodridge retired to Bexhill on Sea until their demise in 1989 and 1990 respectively. The Meech family were residents of Ayot St Peter from the 1890s until almost the end of the 20th century. William James Meech was a gardener and he married Laura Yelland in 1894, their marriage was recorded in the Hatfield registration district. William had been born in Dorchester, Dorset, about 1868 and Laura was born in Totnes, Devon, around 1874. William and Laura had three children, all born in Ayot St Peter – Hilda May who was baptised in Ayot St Peter church on 9 October 1898, Ellen Florence baptised 5 May 1901 and William James baptised 10 January 1904. 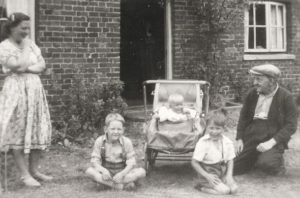 At the time of Hilda’s birth, the family lived in Dowdells Cottage but they probably moved to Ayot Green before Ellen was born. In the 1911 census they lived on Ayot Green. 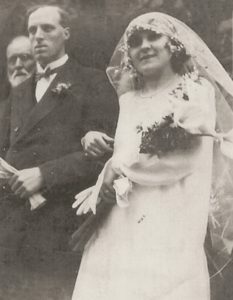 The younger daughter, Ellen Florence Meech married William Albert Dimmock at Ayot St Peter on 26 May 1928. He was the only child of William James Dimmock and Minnie (née Faulkner) who had married in Worcestershire in 1900. 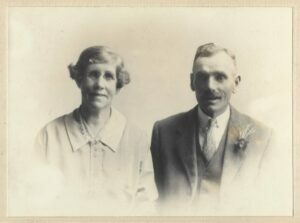 William James Dimmock had been born in Codicote and Minnie Faulkner was born in Tyttenhanger Green near St Albans, but they spent some time living in Smethwick, where their son William was baptised on 3 July 1901. William James Dimmock and Minnie (née Faulkner) – the parents of William Albert Dimmock. A note on the back of this photograph gives their address as 26 Oster Street, St Albans. Their burial place is not known. 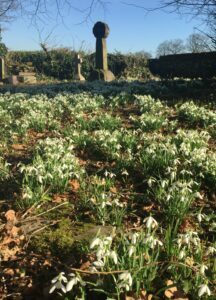 The whole family are buried in the new churchyard at Ayot St Peter. A white marble cross marks the resting place of Laura Meech [née Yelland] who died on 6 November 1921 aged 47, her husband William James Meech who died on 5 August 1938 aged 70, and their son William James Meech who died in 1968. At the time of his death, William James lived at 3 Wilshere Road, Welwyn. Another grave records William Albert Dimmock, who died on 9 February 1978 aged 76 and his wife Ellen Florence Dimmock [née Meech] who died on 12 October 1981 aged 80. Also Hilda May Meech, the sister of Ellen, who died 21 July 1990 aged 91. 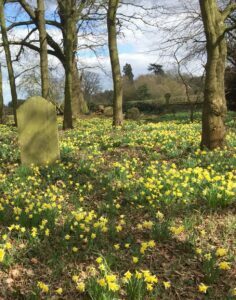 In the burial register the curate has recorded that Hilda lived for 75 years at 16 Ayot Green, although it seems that in their later years the Meech and Dimmock families lived in Wilshere Road. There are still people living around Ayot Green who remember these two families. 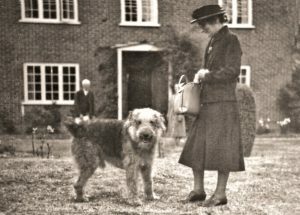 In the period from about 1919 until the 1930s, Eileen Roskell (she spelt it “Roskill”) operated a small private school at 31 and 33 Ayot Green. The school was in one of the cottages and Miss Roskell lived in the other, for some of the time with her elderly mother. Mary Gertrude’s husband John Burrow Roskell died in 1886 at the age of 34 and was buried on 11 November at Penarth. Two years later, their son Henry Vyvyan Burrow died aged four, and was buried in Penarth on 23 July 1888. In the 1891 census, the widowed Mary Gertrude Roskell (she normally used just “Gertrude”) was living with her daughters Gertrude and Eileen in Penarth, where she was a “professor of music”. She was a talented pianist and had been involved in amateur concerts while her husband was alive. Once widowed she became a professional musician, first in Glamorgan and later in London. 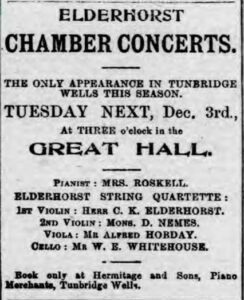 Her first London concerts appear to have been in 1895, and the newspaper reports mention Carl Elderhorst as the violinist. By the time of the 1901 census the family had moved to Hove, Sussex, and Mary Gertrude, now aged 47, again described herself as a “professor of music”. Her daughter Gertrude still lived at home aged 22, and also her two surviving sons were present – Clifford aged 15 and Douglas aged 20, who was an officer with P&O. 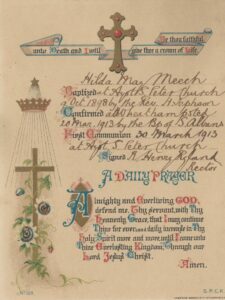 On 29 January 1903, the widow Mary Gertrude married Carl Kellman Elderhorst (formerly Kellman) at St Mary’s Bryanston Square, Marylebone, London. 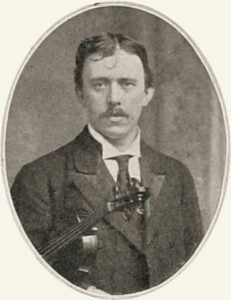 He was a bachelor aged 36 and a “professor of music”. At some point after 1911 the couple moved to Knebworth in Hertfordshire. Carl died in 1929 aged 64 and was buried in Knebworth – the burial register gives his address as 63 Pondcroft Road. After his death Mary Gertrude lived on Ayot Green with her daughter Eileen but by the time of the 1939 register had moved to Wells-next-the-Sea, Norfolk where she died at the age of 92 in 1946. She is buried in Knebworth. 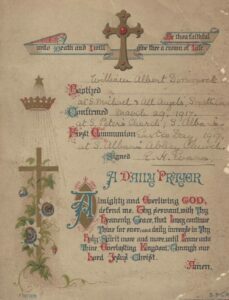 Mary Gertrude’s daughter Gertrude Lucinda joined the VAD (Voluntary Aid Detachment) on 11 September 1915 and was posted to Alexandria where she died from appendicitis and peritonitis on 27 October aged 36, after only four weeks service. She is buried in Alexandria (Chatby) Military and War Memorial Cemetery. Gertrude Lucinda is remembered on Welwyn village war memorial. Mary Gertrude’s two surviving sons John Douglas and Clifford Moyse emigrated to New Zealand where both died young from natural causes – John died aged 22 from appendicitis and peritonitis while working as a station hand and was buried on the 7 November 1902 at Taumata-o-mihi, near Gisborne. Clifford died on 17 December 1908 aged 23 and is buried in Wakapuaka Cemetery, Nelson. At least from the time she arrived on Ayot Green, Eileen used the spelling “Roskill” for her surname, although her father’s surname was clearly “Roskell” and this was the spelling used by her parents and siblings. Eileen was recorded as “Roskill” in the electoral register from 1919, and pupils at her school called her “Miss Roskill”. 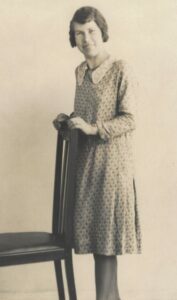 It is unclear what happened to Eileen after she left Ayot Green, but she died on 23 March 1976 at the Fairfield Hospital, Stotfold, Bedfordshire (the Three Counties Asylum) aged 95.